Christmas break is OVER, so time for the return of Games For The Rest of Us, the series by and for the casual gamer. I must admit I barely touched my phone for gaming purposes over the holidays, but it was largely due to being re-caught in the evil clutches of World of Warcraft. Damn you WoW. Despite spending much of my time in Azeroth, I did manage to find a tasty treat to serve up to you this week; Stupid Zombies by GameResort. If you're tired of those Angry Birds and their smarmy little green piggy friends, then have I got good news for you. Do you like shotguns? YEAH! Saving humanity from the threat of the undead? YEAH! Characters that bear a passing resemblance to Barry Steakfries? HELL YEAH! Then Stupid Zombies may be right up your alley. 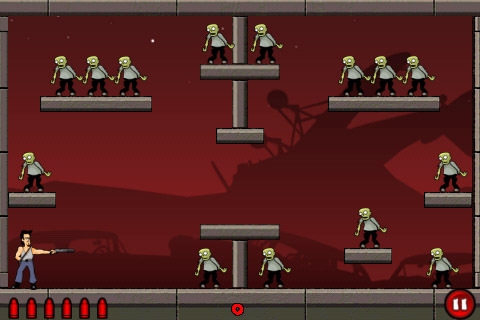 A physics puzzler in the vein of the aforementioned Angry Birds, Stupid Zombies arms you with a limited number of bullets to dispose of a horde of zombies. Your bullets will ricochet off the walls and solid blocks making the angle of your aim your most important weapon in taking down zombies with the fewest amount of bullets possible. For every bullet you don't use, you get extra points. Easy right? If you get stuck, there is the option of buying 'Air Raids' which will clear all the zombies in the level and allow you to progress. I think you get a freebie one when you first start playing, but after that it'll cost you another $0.99 for 5 air raids. It's a fairly reasonable price for the add-on, the levels aren't THAT hard, and if you feel the urge to be a cop-out and skip levels, you SHOULD pay for it! The design of the game is simple, but the gameplay is fun and very addictive. The further you progress in the game, the more interesting it gets. Explosive barrels, wooden planks and switches to hit keep you thinking about more than just your angles. And maybe I'm just a sicko, but the wet squish as you shoot a zombie through the head followed by their limp ragdoll body tumbling to the ground was the aspect that really kept me going. Seriously, you do it once and you'll never go back to pinging a bird out of a slingshot. 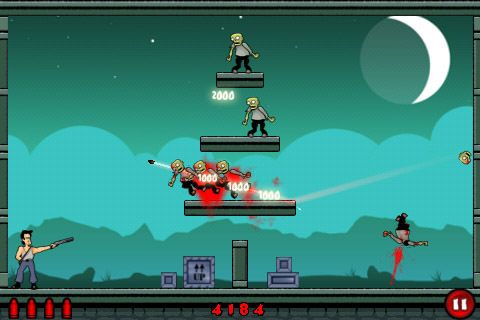 One second after this action shot was taken, the bullet wiped out all the zombies. Huzzah! I enjoyed this game a lot, and I consider it definite bang for your buck, given that at the time of review there were 480 (!) levels to conquer. Four hundred and eighty. Madness. I'll be playing this one for a long time to come. This game is a lot of fun. I was bummed that Fragger was not on the Android Market when I switched phones, but this makes up for it and then some.